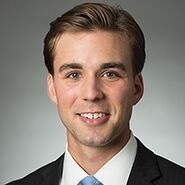 MILWAUKEE, Wis. — Quarles & Brady is pleased to announce that Joe Poehlmann has been elected to the Milwaukee Young Lawyers Association's (MYLA) Board of Directors. Joe is a member of the firm's Litigation & Dispute Resolution Practice Group, where he focuses his practice on general civil and complex commercial litigation. Joe's recent experience includes insurance coverage disputes, broker malpractice defense, trade secret protection, and environmental litigation. MYLA was formed and functions to perform charitable and educational activities for the Milwaukee community, to advance the professional education and welfare of young lawyers, to promote fellowship among themselves and the members of the Bar as a whole, to advance the standards of the legal profession and the administration of justice, to promote the general welfare of the community, and to engage in any lawful activity within the purposes for which corporations may be organized under Chapter 181 of the Wisconsin Statutes.